HeHe, Those kids are wimps. 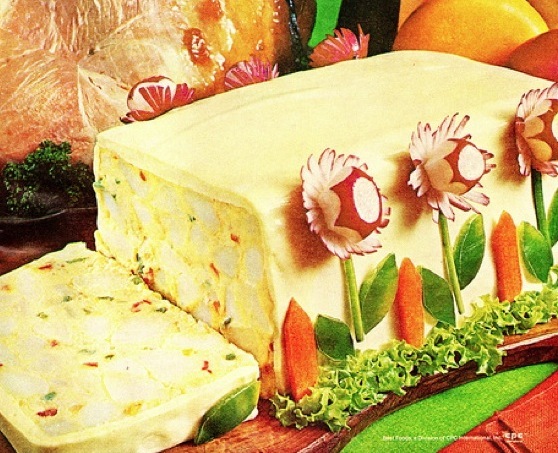 They did go crazy with the gelatin back then. My favorite was the pie. I can see why everyone doesn't want Grandma to bring it for Thanksgiving. Macaroni and cheese is the way to go. Well maybe with a little gelatin or egg to make it congeal. I believe you get the prize for the best F.
I don't remember any of these recipes!! The 1970's was a bizarre era for food! I think the 50 's were the worst. I feel someone, somewhere is pulling our leg. Can these recipes relly be that awful? I mean they are food, no? May be weird, but... that bad?